After exports from Ceyhan averaged 540,000 bpd through the first nine months of the year, loadings of Kirkuk crude dropped to 430,000 bpd in October, and are lower once again in November, after Iraqi government forces reclaimed Kurdish oil fields last month. The Iraqi oil minister, Jabar al-Luaibi, announced last week a preliminary agreement to export oil from the Kirkuk oil fields to Iran. Until a pipeline is constructed to move the crude, the oil will be transported via tank trucks. 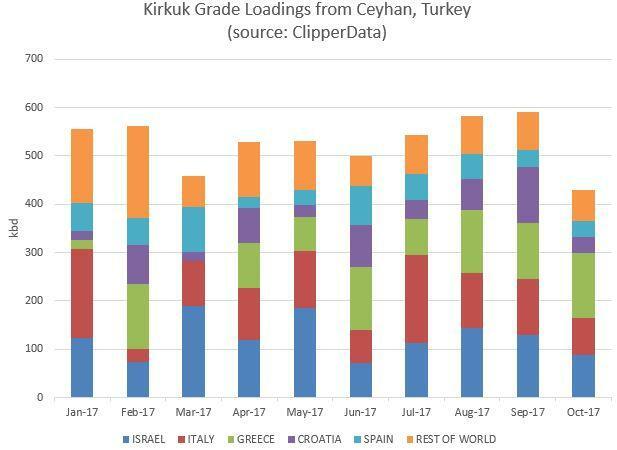 The leading destinations for Kirkuk crude are Israel, Italy, Greece, Croatia and Spain, which account for eighty percent of flows (hark, below). Jabar Al-Luaibi also announced last week that exports out of the southern part of the country would rise 200,000 bpd to offset halted production in the north. Exports from southern Iraq of Basrah Light and Basrah Heavy have averaged 3.2 million barrels per day through the first 10 months of the year, with Basrah Light accounting for nearly three-quarters of these loadings. As Ceyhan loadings out of Kirkuk crude dip, we are just starting to see a response in southern Iraqi crude exports. 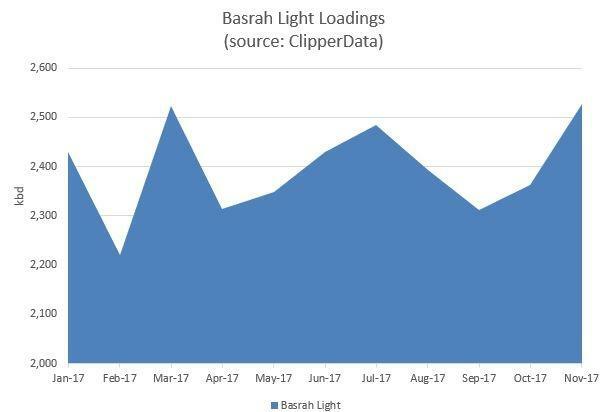 Loadings of Basrah Light so far in November are at their highest pace since September of last year, lifting total southern Iraqi exports so far this month to the highest since March.